Reader Jon Solomonson recently brought something interesting to my attention: Former NFL linebacker Mike Curtis, who was best known for his time with the Colts but also played for the Seahawks, used to wear his chinstrap on top of his helmet during practices or while standing on the sidelines. In addition to the photo shown above, you can see him doing it in several of these shots and in this video footage. I was intrigued. Did Curtis arrange to have a snap installed on his helmet crown (sort of like Sterling Sharpe used to have)? If so, was it put there by the equipment staff or by the helmet manufacturer? Uni Watch: How did you start wearing your chinstrap on top of your helmet? Mike Curtis: I started doing that so I wouldn’t have to deal with the strap while we were practicing. There’s a hole up there on the top of the helmet for air circulation, and I could stick the end of that thing [he apparently means the snap or buckle — PL] in there, in the roof of my hat. I only did it in practice, not in games. UW: So you didn’t have a snap or other piece of hardware installed up there? You just used the ventilation hole that was already there? UW: Was this your idea, or did you see other players doing it and get the idea from them? MC: Just something I did myself. UW: I’ve only seen photos of you wearing the strap this way when you were with the Seahawks. Did you also do it with the Colts, or even in college? MC: Yep, always did it. Also: If you go back and look at the full-size version of the photo at the top of the page, you can see that Curtis had his uniform number written on his chinstrap. 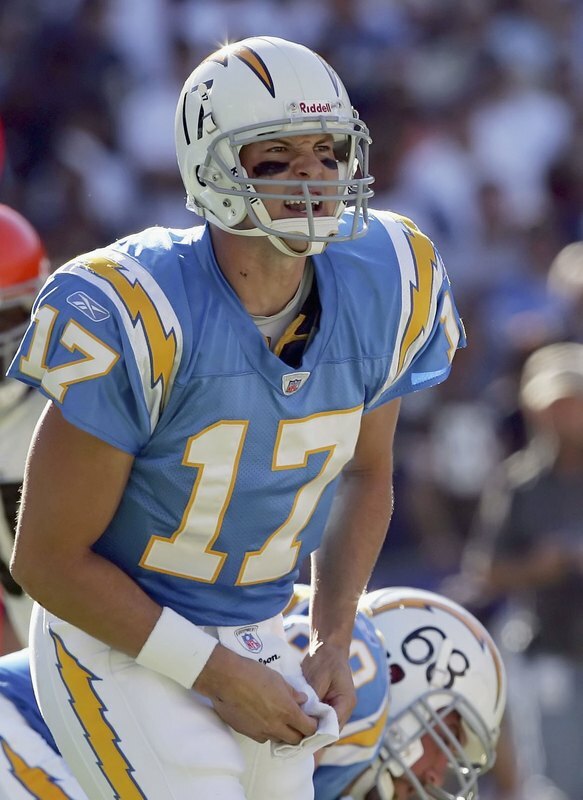 I’ve only known of two other teams with uni-numbered chinstraps: the Chargers and Chiefs. Pro Football News: Looks like the Eagles will wear black on Christmas Day. It’s an odd color choice, because they’ll be playing the Raiders (from Blake Fox). 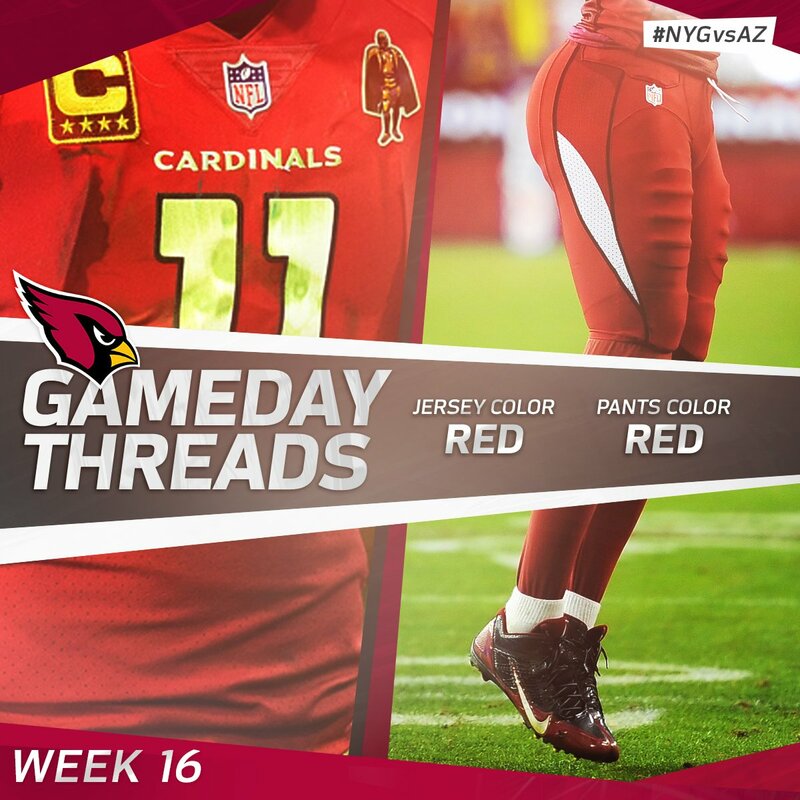 … The Cardinals will go mono-red on Sunday against the Giants (from Josh Pearlman). … In preparation for Sunday’s game against the Chiefs, the Dolphins posted footage of a 1971 playoff game between the two teams. Check out the Miami jerseys, with no sleeve stripes! (From Russell Goutierez.) … These Steelers had some seriously dirty uniforms after a very muddy loss to the Browns 35 years ago (from @PGH_Sports_Date). … The Charlotte Checkers of the AHL wore jerseys last night designed by Panthers QB Cam Newton, featuring Newton himself (from Scott Leighty). … Following an incident in the Cowboys/Raiders game Sunday, the NFL told officials not to use index cards to measure first downs. … Interested in a Cowboys-branded gym? Cowboys Fit is the place for you (thanks Brinke). … Looks like pro wrestling mogul Vince McMahon, who founded the ill-fated XFL back in the early aughts, may be looking to get back into the world of pro football. 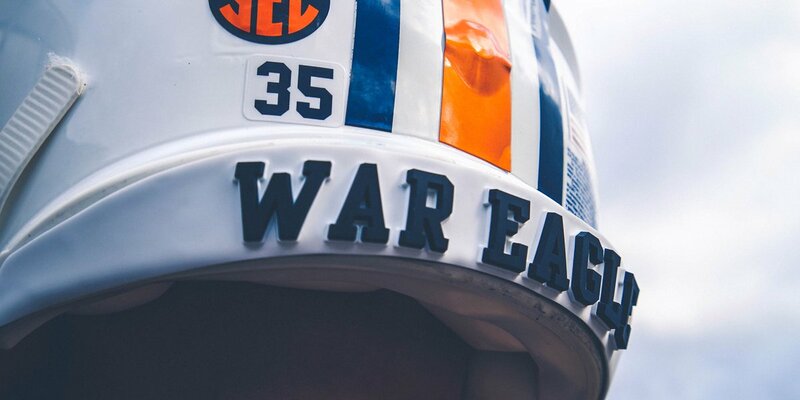 College Football News: Auburn helmets will have raised “War Eagle” lettering on the back bumper for their Peach Bowl game. 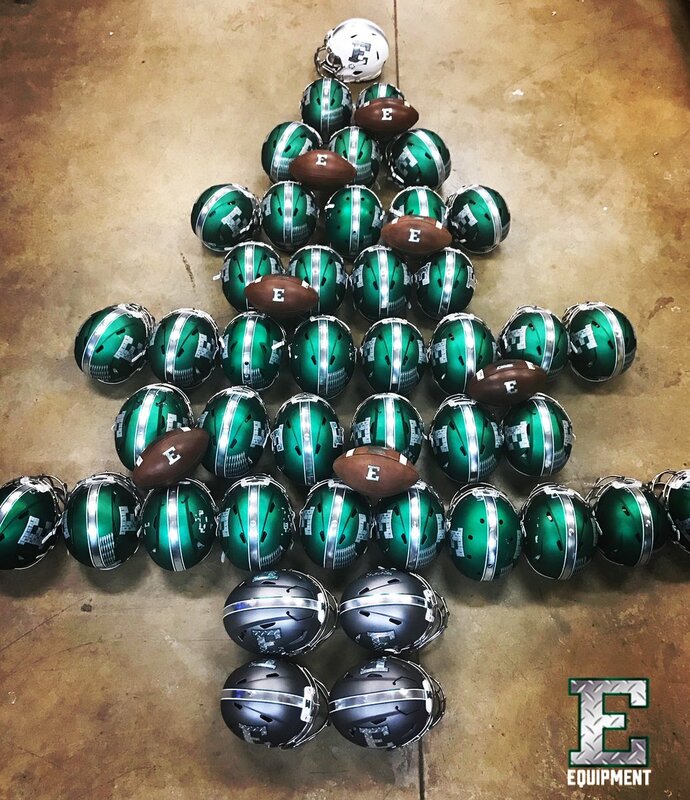 … The Eastern Michigan football equipment staff celebrates the holidays with a tree made of helmets and footballs. 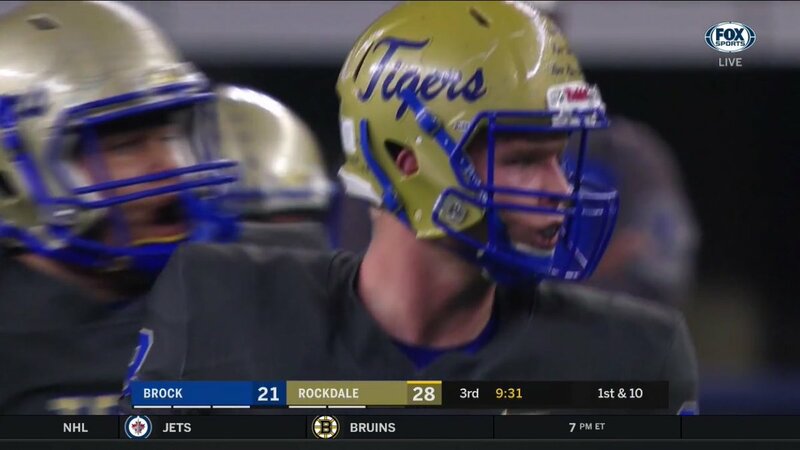 … It appears helmets for Rockdale High School in Texas have two different shades of gold (from Glen Brockenbush). 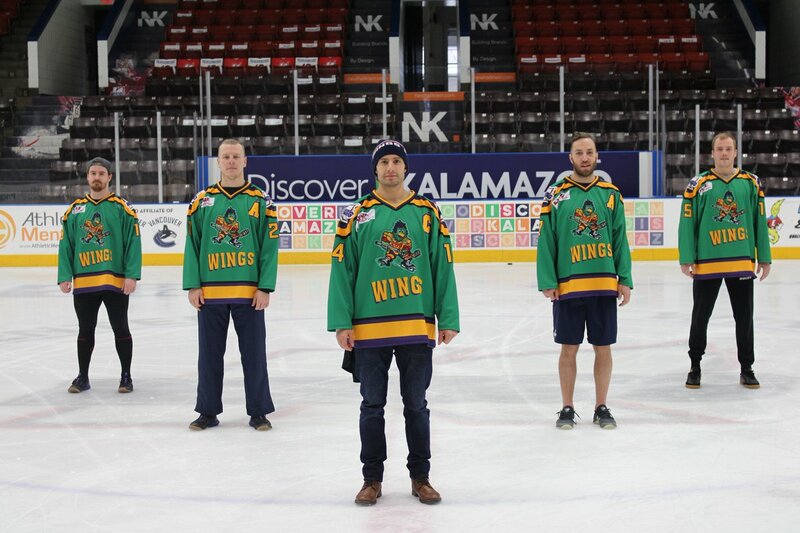 Hockey News: The Kalamazoo Wings, EHCL affiliate of the Canucks, will celebrate 25 years of The Mighty Ducks with these jerseys tonight. … The Orlando Solar Bears and Wilkes-Barre/Scranton Penguins are getting in the holiday spirit with their jerseys (from Mike Slavonic). … Cross-listed from the football section: The Charlotte Checkers of the AHL wore jerseys last night designed by Carolina Panthers QB Cam Newton, featuring Cam Newton (from Scott Leighty). … TheGoalNet.com did a review of goalie gear trends in 2017. … A new museum exhibit on the history of ice skating in New York (NYT link) includes some archival NHL gear. 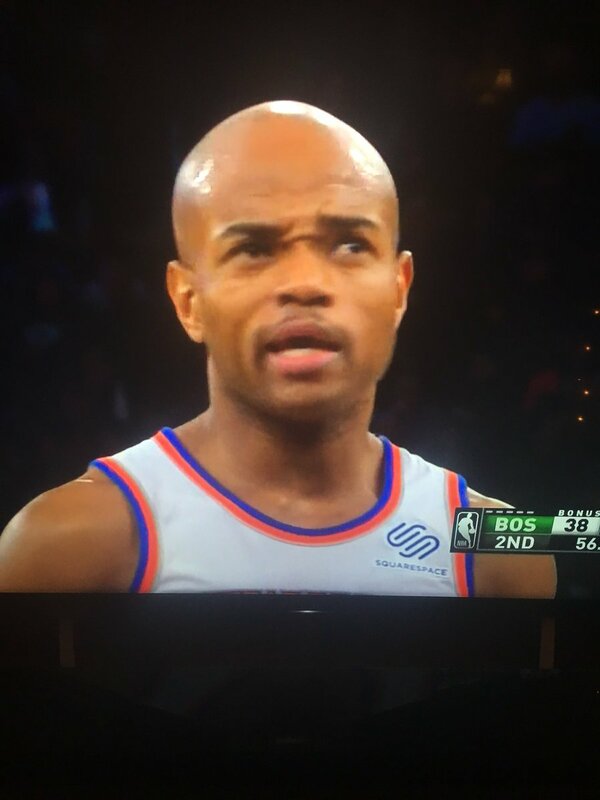 NBA News: Knicks G Jarrett Jack was missing the Nike logo on his jersey last night (from Ryan Spies). … A Reddit user created NBA jersey concepts based on ugly Christmas sweaters (from Jeremy Hartman). 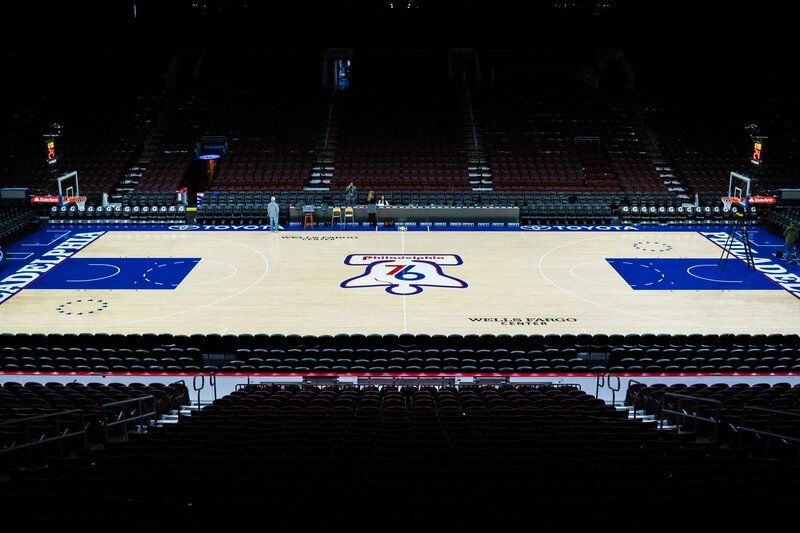 … The Sixers went with the bell logo design at center court last night. That court design was supposedly going to be used with the team’s second alternate jersey, which hasn’t yet been released. The team wore its standard blue uniforms last night (from @CtownManly). … The Warriors released their jersey schedule for the rest of the season (from @seanwc92). … Apparently Nike’s replica NBA jerseys have issues too, as the numbers apparently peel off very easily. Check out the reviews here (from Michael Curry). 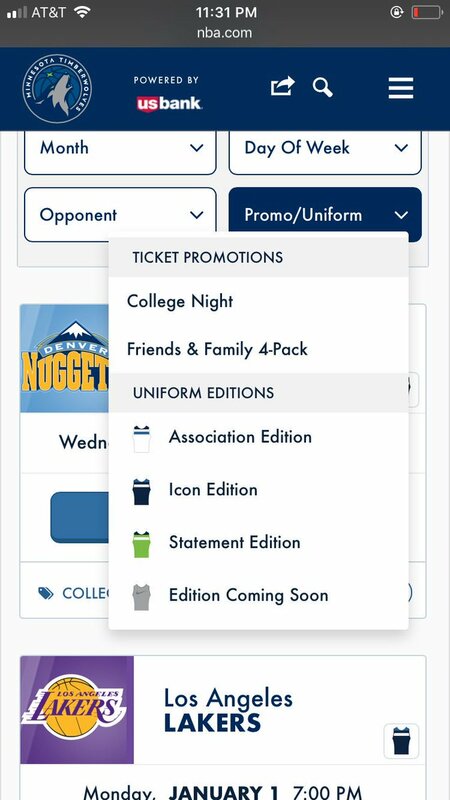 … The Timberwolves’ website now allows fans to purchase their tickets based on which uniform the team is wearing (from F.K. Yaaj). Soccer News: New home and away kits for Atlantic City FC of the NPSL (from Ed Zelaski). 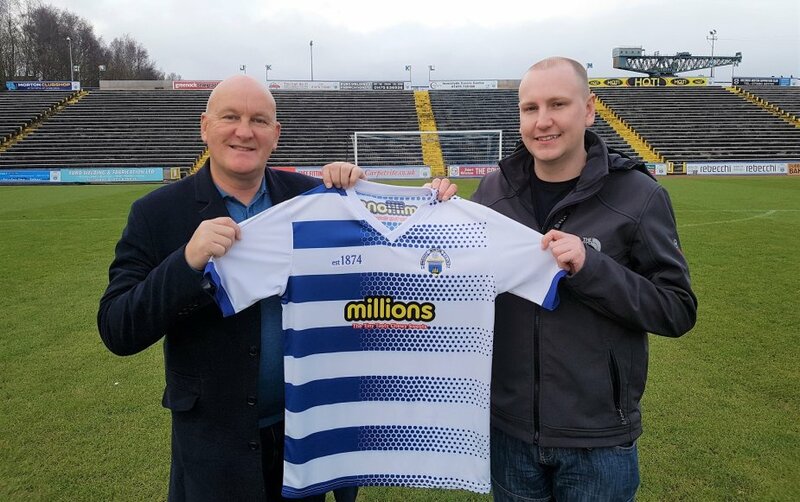 … Scottish Championship team Greenock Morton FC has new home kits for the 2018-19 season. The shirt was designed by a fan and won a fan vote (thanks Jamie). Grab Bag: This local uniform shop in Miami Township, Ohio makes band uniforms for schools across the country (from Liberty Bowman). Phil will be here tomorrow and Sunday with his usual weekend extravaganza. I’ll be back on Monday, which is Christmas Day, with the winners of annual year-end raffle. Dolphins-Chiefs 1971: I could not get the video to play, but here is a pic. For the Cam Newton/Charlotte Checkers items, the second link in the football section one and both links in the hockey section one are broken. Coding glitch. All now fixed. Those were some nice looking Seahawks uniforms (even though the blue and silver combo was a bit a copy of the Lions and Cowboys). Blue and green is such an underused combo. It’s also odd because green is one of the primary colors associated with Christmas, and the Eagles’ primary color is green. Shouldn’t be surprised. Its 2017, and lots of marketing people, especially in sports, have no common sense. Hot dog, we have a wiener. Thank you to you & the entire Uni-Watch crew for another terrific year of Uni-Watch(ing). Thanks for all the hard work you all put in to provide us with one of the most interesting & worthwhile sites on the ‘net. Also thank you for sharing glimpses of your life: cooking, travel, & your super-cool apartment decor. All the best to everyone, writers, contributors, & readers in the New Year! And thanks for getting that the Christmas season is a bummer for some of us. According to the Gridiron Uniform Database the Dolphins jerseys did not have stripes on their sleeves throughout the 1970 and 1971 regular seasons. The stripes apparently returned in 1972. Perhaps Coach Shula wanted the team to earn its stripes. The stripes were inconsistently used in 1972, as several players continued to go stripe-less, playing side-by-side with stripe-sleeved players in the same game. here’s a nice shot of Griese and Morrall demonstrating that. First regular season game at Arrowhead Stadium, entertaining the same team that knocked them out of the playoffs a few months earlier. Interesting that the Chiefs were on the sideline with the sun shining in their eyes. I always thought that visitors were given that sideline as part of home field advantage. That time of year, they may have wanted the “sun” side of the field for warmth. Home team chooses its sideline. Some want the “sunny side” so it is warmer for early afternoon games late in the season. The sunny side is also much more visible on TV. I’ve always preferred the jerseys with the stripes due to the number font. I like the more slender numbers. It differed slightly from what the rest of the NFL (minus the Bears) used at that time. 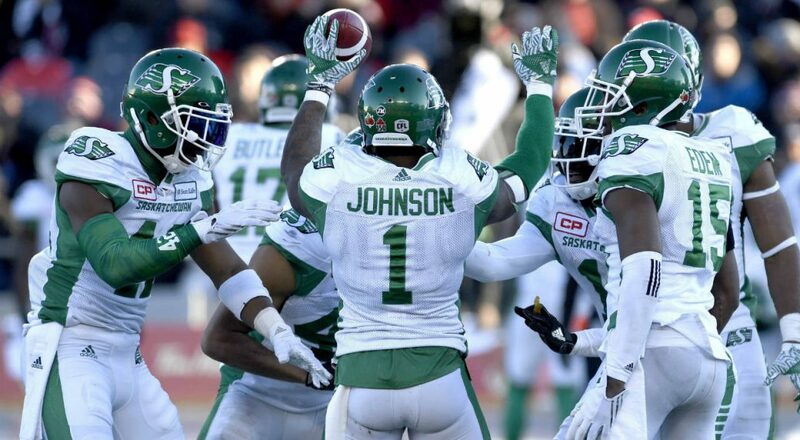 Agreed that the jerseys with stripes looked a lot better than their stripeless counterparts. Back in the late 1960s / early ’70s, a number of teams wore pretty lousy-looking warm-weather jerseys, a number of them with no stripes, especially during pre-season. I sure disliked the way those jerseys looked. 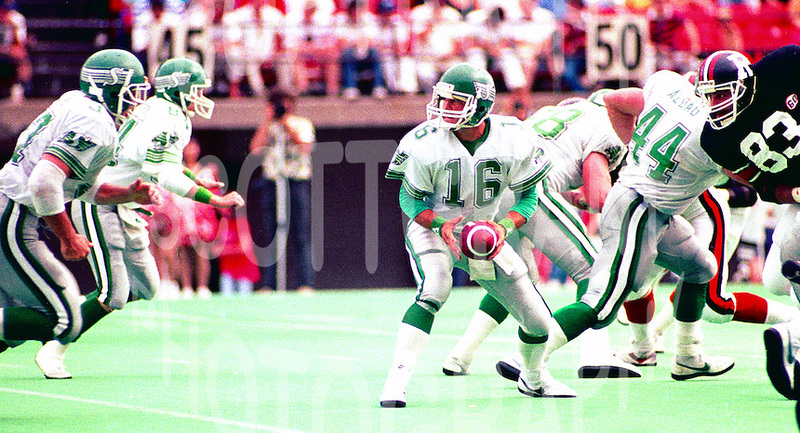 Mike Curtis also has his number on his hand pads. btw, we all know what Mike Curtis is *most* famous for, right? Tackling some “Dumb Guy” who tried to steal the football during a game. I looked up the game-1971 Dolphins at Colts-during the brief “No Stripes on Sleeves” Era for Miami. I’m still smarting from that one!! 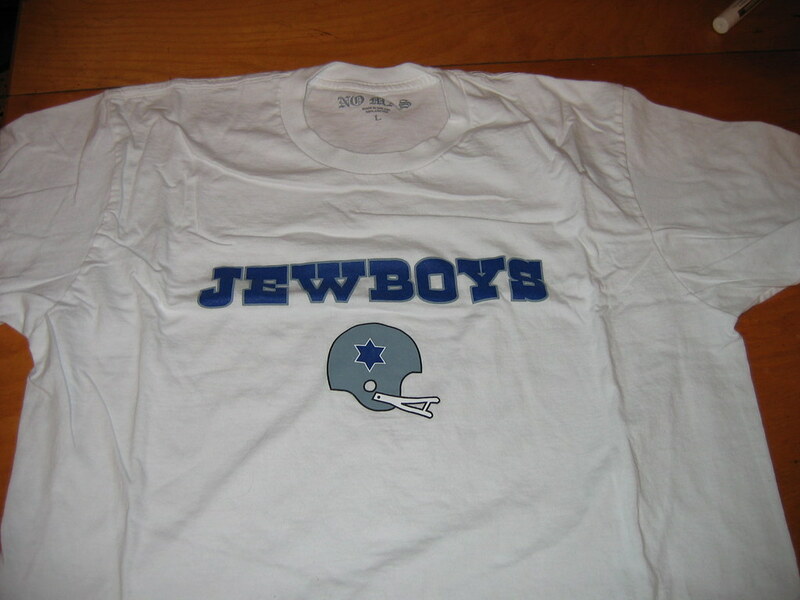 If the Cowboys simply added another point to their star they’d be the perfect Hanukkah team! Maybe the Chiefs could swap gold for green? No Mas had that idea over a decade ago! 1971 Dolphins/Chiefs no stripe game. 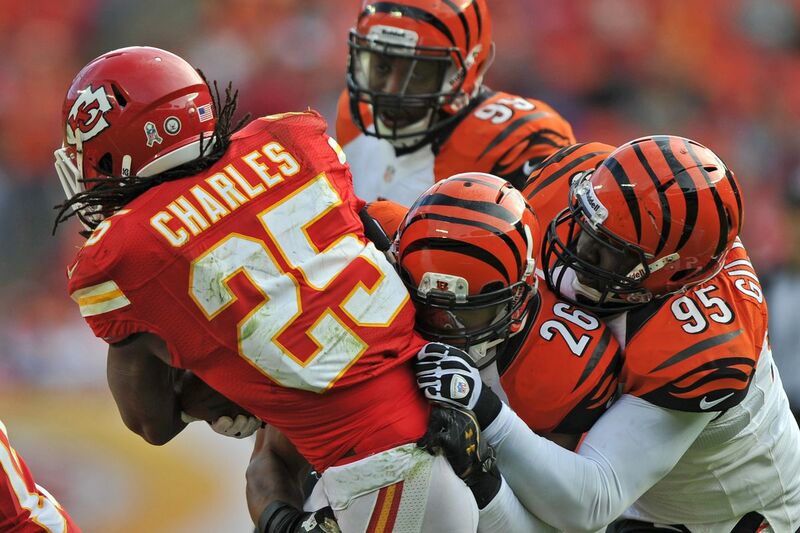 I was curious why a playoff game in KC looked so balmy – everyone in short sleeves. Checked and turns out the Christmas Day game (1st ever) was an unusually warm one in KC – gametime 62 deg. was also the last played in Municipal Stadium (per Wikipedia). One of two famous playoff games to be the last game played in a particular stadium. Can anyone guess the other? Hint: It wasn’t 62 degrees out. But I am guessing the answer you are looking for is Tuck Rule game. Yes the Tuck Rule Game. I live near Philly-but the last football game at the Vet wasn’t particularly memorable. Eagles fans would like to forget it though. Plus, while the NFC title game may have been the last Eagles game played at the Vet, the final game overall was a 5-2 Phillies season-ending loss to Greg Maddux and the Braves. Rival leagues are the best thing in the history of sports. Especially ones where teams move or fold mid-season, and other assorted chaos. While I don’t think we’ll see that again, still hoping the XFL gets off the ground again. 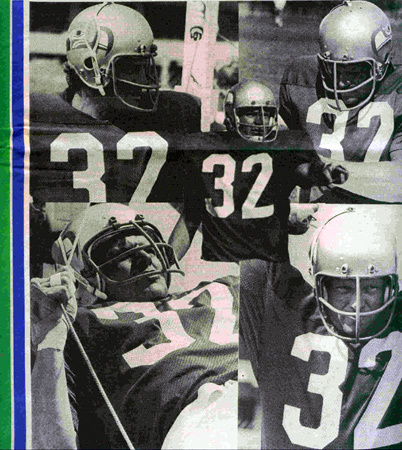 Delightful quirks of individual use aside, boy howdy was the old Seahawks helmet a beauty. Seattle really set the bar for how to make a silver helmet work. The wraparound logo with the colours makes the Seahawks helmets great. The wraparound logo on the helmet was innovative in the 1970s. Seahawks are the only team I can think of left (pro and college) that still have it. The photo of Mike Curtis trying to unscrew Roman Gabriel’s head is a classic. I don’t think I ever saw a shot of Curtis where he wasn’t totally intense with a scowl. Here’s a chinstrap bit that has intrigued me for a few years. Has anyone else noticed that the 3 last starting QBs for the Green Bay Packers (Brett Favre, Aaron Rodgers and now Brett Hundley) have all used a single strap chinstrap not a double strap? Are there any other players in the NFL that use a single strap chinstrap or is this just a GB thing? More so than the single strap chinstrap, I always found it interesting that Favre & Rodgers unbuckle their chinstrap with their left hand, despite each being right-handed. Not sure if Hundley does that or not. Hmmmm, yes, has anyone noticed? Man, I miss the 90’s goalie equipment. Colorful, bold, and clear. I hate the overly intricate mask graphics that have become prevalent nowadays (I think by the same mask graphics guy, the Brandiose of the mask graphics world), and don’t get me started on the white pad trend. I’m glad that we’re seeing pushback on both trends. I was afraid that the dumb theory about shooters having a harder time picking corners with white pads thing was going to prevent us from ever going back to the beautiful colorful pads of the past. That never aligned with reality. The UW team deserves credit for running a redesign contest that may now be closely associated with an actual uni-worthy event. The XFL were uni pioneers and if it gets reprised it could feature a lot of innovative looks. Well done boys! Apparently his number was grandfathered in when the numbering conventions were standardized in 1973. Of course I mean Mr. Curtis’ number. Now, I do need to hit the gym much more often in 2018 than I did in 2017, but why would I want a “luxury gym” with the most bizarre branding? Even as an ip/advertising lawyer, my brain can’t wrap myself around that. The Seahawks should have kept the original unis. Such a classic set. OMG. the Wyoming CMU game with yellow, brown, white, maroon, blue, orange is my vote for the 1 on 5 and 1 of the bowl games.